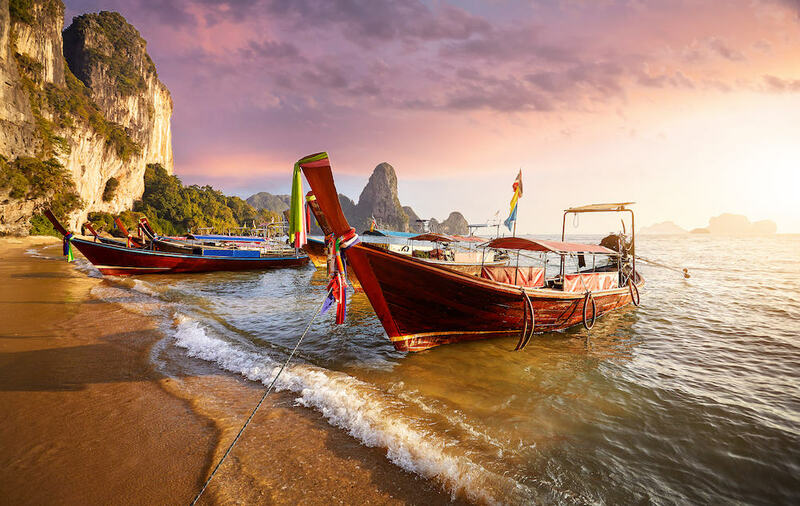 Krabi is a gorgeous province of southern Thailand, known for its white sandy beaches, turquoise waters and limestone cliffs. It’s considered one of the most relaxing places in the world, and you’ll quickly understand why. 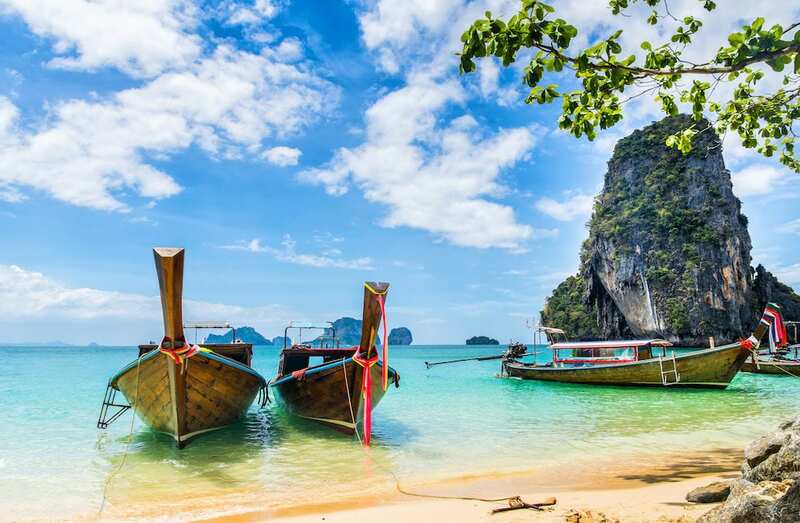 Krabi is home to many famous island destinations, including the Phi Phi Islands and Koh Lanta. The capital town, also named Krabi, is surrounded by lush mangrove forests and has some great cultural attractions. 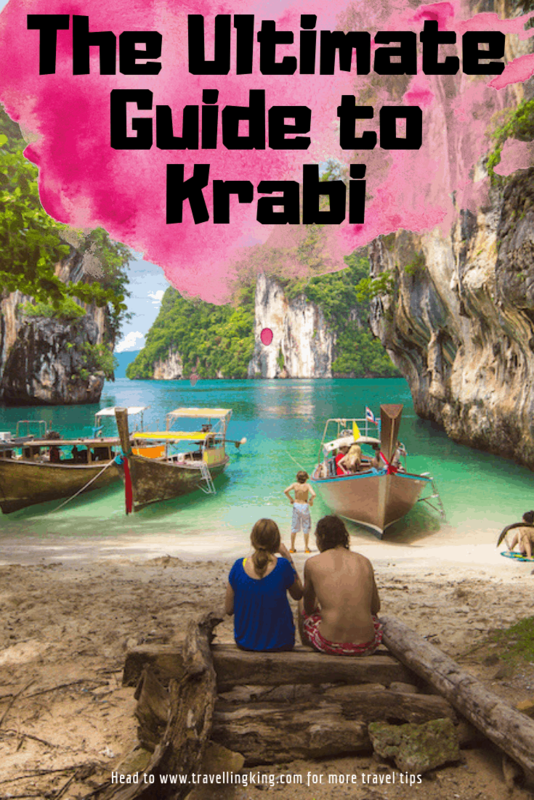 This ultimate guide will show you where to go and what to do in Krabi. 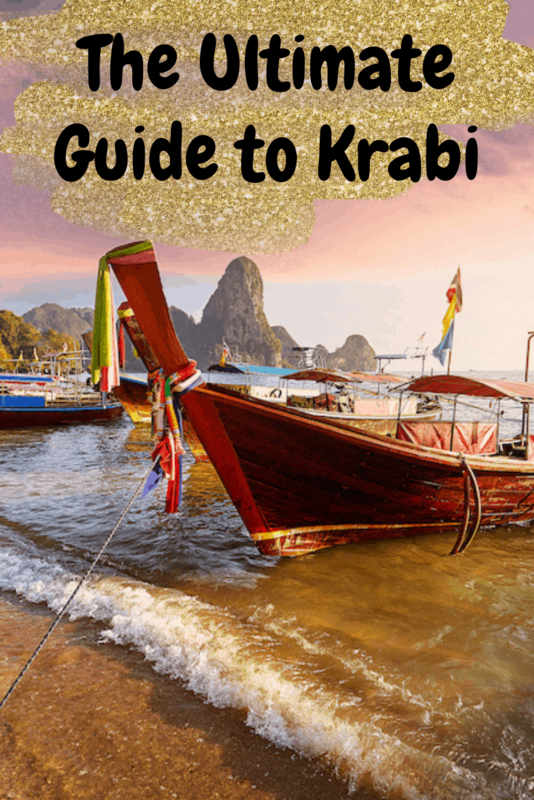 Keep reading to find out all the top Krabi attractions so you can plan the best trip possible. 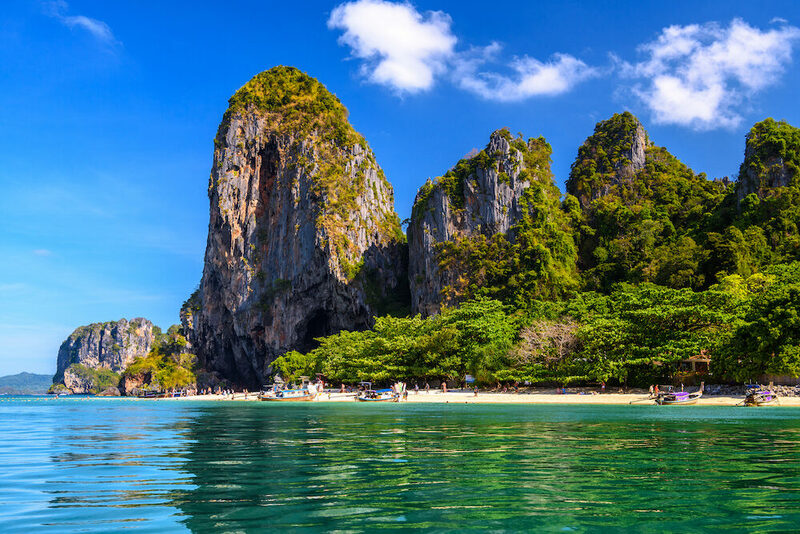 Krabi is 170 kilometres away from Phuket and 800 kilometres south of Bangkok. There are many ways to get to Krabi from these Thai cities. It’s up to you to decide between air, road or sea based on your budget, comfort requirements, and time constraints. Krabi has a small airport with flights from only four other countries: Malaysia, Singapore, China and Qatar. There are also domestic flights to and from Bangkok, Chiang Mai, and Koh Samui. 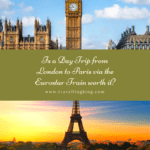 Although flying is one of the most convenient options, flights here tend to be on the more expensive side. 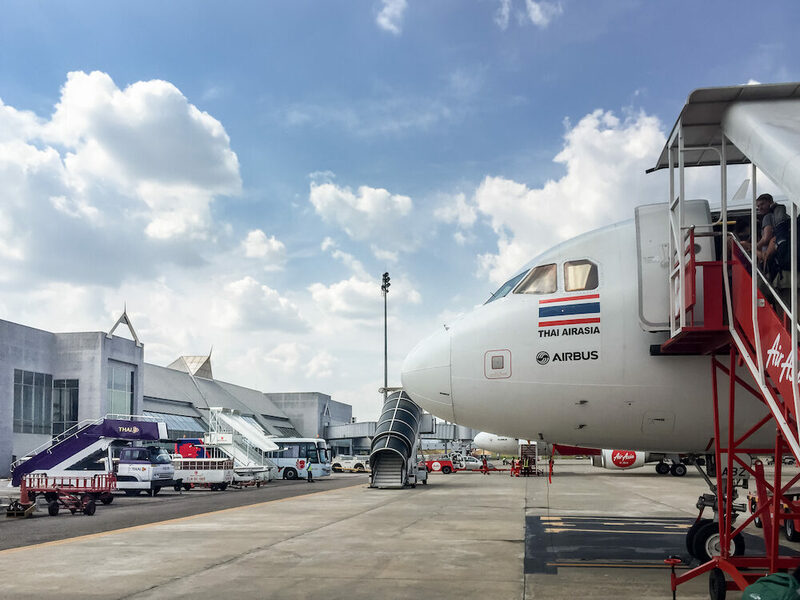 If you do decide to catch a flight from Bangkok to Krabi, remember that Bangkok has two different airports. If you’re arriving at Suvarnabhumi (BKK), make sure you’re not departing from Don Mueang (DMK) and vice versa. A much more popular airport to fly into is Phuket (HKT). As it is a larger airport, it is served by a wider range of international airlines with regular flights. The journey from Phuket to Krabi will take you about two to four hours by land, depending on your transport of choice. Minibuses and government buses, for example, are very affordable but take longer. 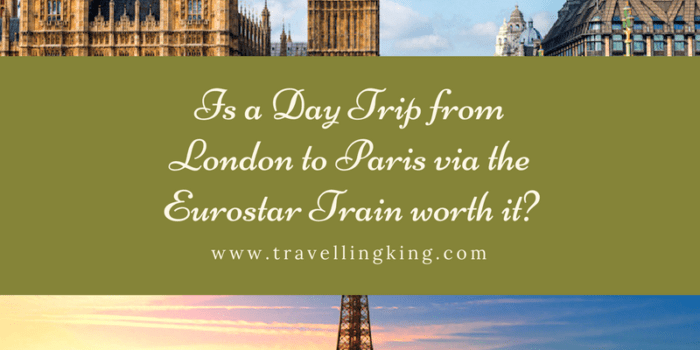 If you’re not in any rush, you’ll save a ton of money and won’t have to worry about booking in advance as they run so frequently. If you decide on a private transfer or taxi, you’ll arrive at your accommodation directly but pay a whole lot more. During high season, there are daily ferries and speedboats that cross the Phang Nga Bay between Phuket and Krabi. Though this is the shortest route, you’ll still need to factor in travel time to and from either piers. 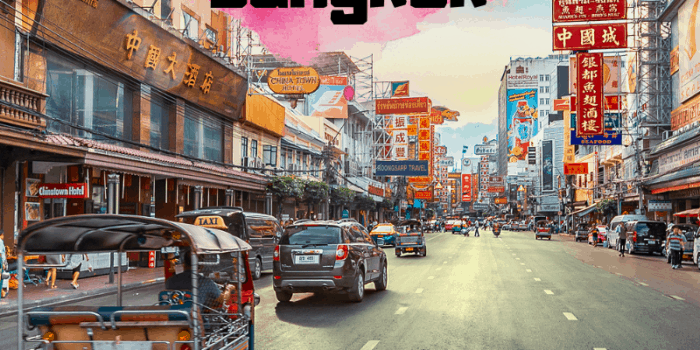 Aside from flying, you can also catch a train or bus from Bangkok. Be prepared for a lengthy trip, as the full air-conditioned bus journey will take 12 hours. 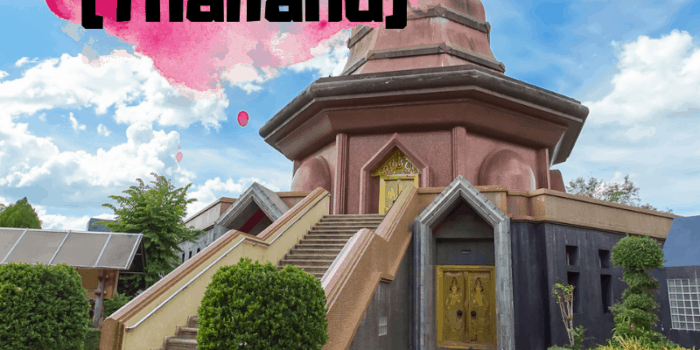 While there is no train station in Krabi, you can depart from Hua Lamphong Station and go to Surat Thani, then catch a bus for the remainder of the distance. 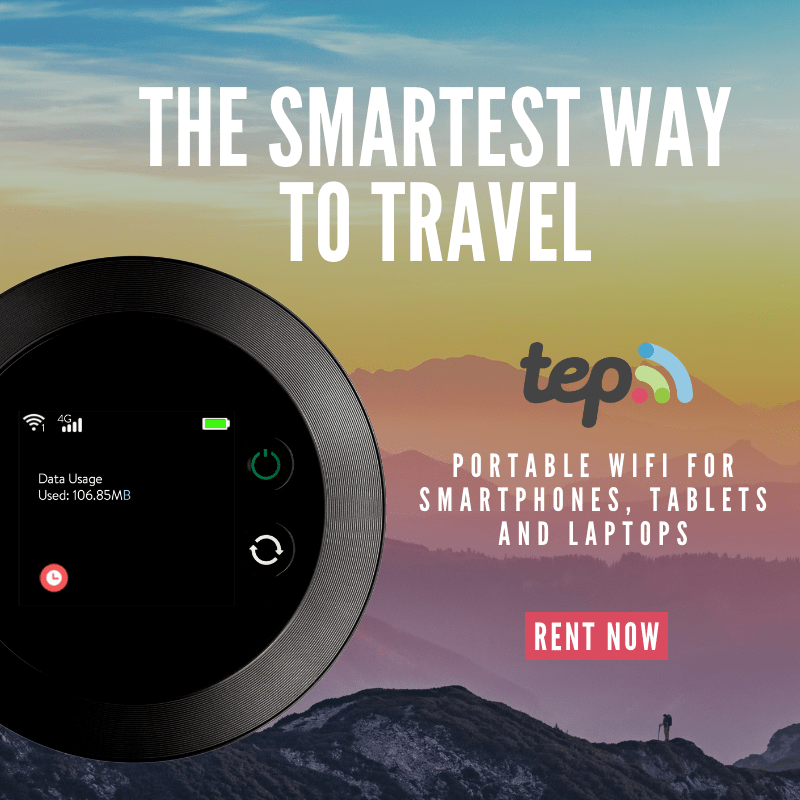 You’ll be able to book first-class, 12-hour sleeper trains or daytime trains that take eight hours. Before visiting Thailand for the first time, you may worry about how you’re going to communicate. As Krabi is a top tourist destination, many locals working in the service and hospitality industries can speak basic English. If you can, it’s a nice gesture to at least learn hello and thank you in Thai. You’ll use the currency Thai baht, which comes in both coins and banknotes. Most places only accept cash, though you can often use credit cards at more upscale restaurants. You should always have enough cash on you for the day. Tipping is not required or expected here. Krabi has numerous transport options. 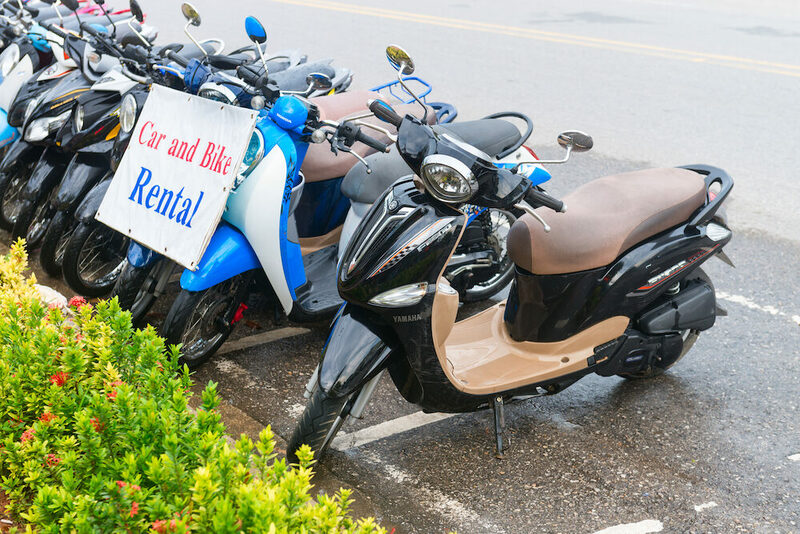 A popular method to get yourself around is to rent a scooter. If you’re in town for a week, you can find discounted rates. Remember that people drive on the left side of the road in Thailand. Always be safe and responsible while driving a scooter, and wear a helmet! If you’re hesitant about your driving skills, stick to taxis. Download the Grab app so you can book affordable rides whenever you need. Grab is the equivalent of Uber, which no longer operates in Southeast Asia as of this year. There are always promotions going on to give you a further discount on your rides. You’ll become familiar with ferries and speedboats as a way to get between islands in Krabi. These are several daily services to Phuket, Koh Lanta and Phi Phi. Inexpensive boat taxis also run along the coast and are a scenic way to get between Ao Nang, Ton Sai, Railay, Phra Nang and Krabi Town. Although Krabi experiences warm weather year-round, you’ll want to avoid the summer monsoon season. The wettest months are August to October, so a trip during these months may ruin your plans for sun baking on the beach. The perfect time to visit is from January to March. You’ll miss the tourist rush from Christmas and New Year’s Eve, as well as the Northern Hemisphere summer vacation crowd. Not only that, but the conditions are near perfect, with very little rain and warm but mild temperatures. Wondering what else there is to do other than lay at the beach all day? 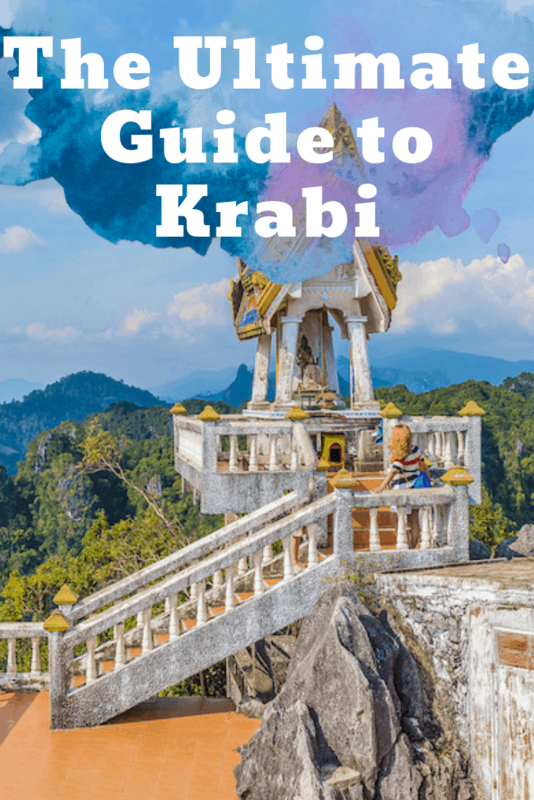 Here are some ideas for fun things to do in Krabi. 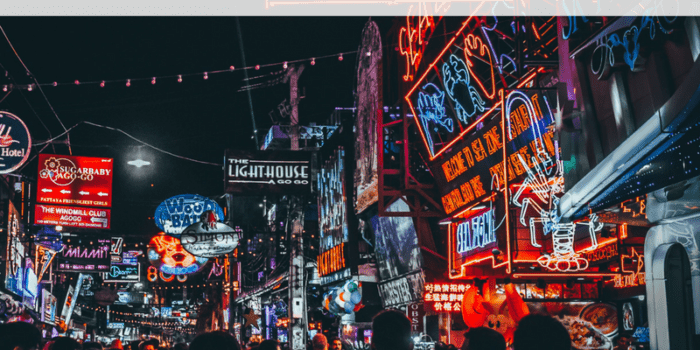 One of the most lively things to do in Krabi at night is to head to Walking Street (known as Thanon Khon Dern in Thai). A night market is held on Fridays, Saturdays and Sundays from six o’clock. 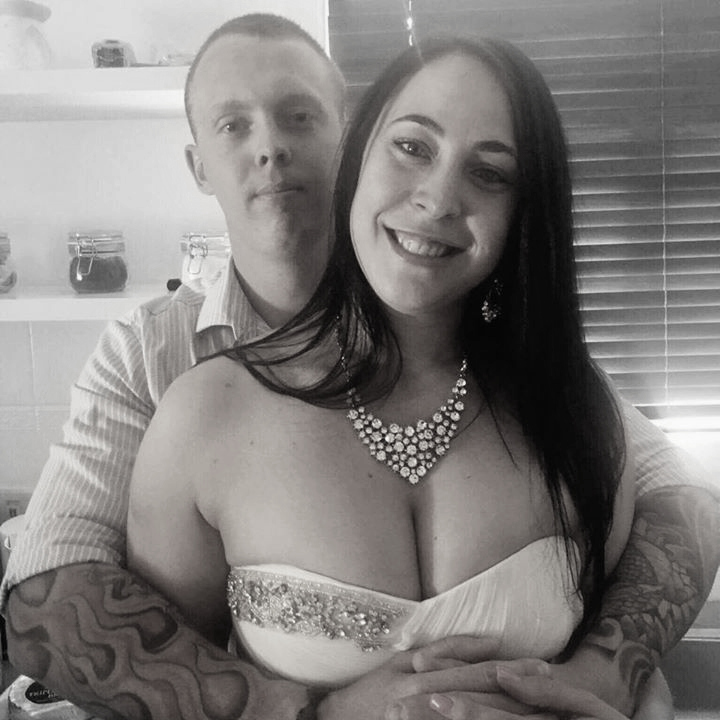 You’ll find a wide variety of items for sale, from handmade oyster pearl jewellery to classic souvenirs and T-shirts. Of course, there will also be a ton of delicious street food vendors. There are always plastic chairs and tables to sit down at, so there’s no need to be in a rush. 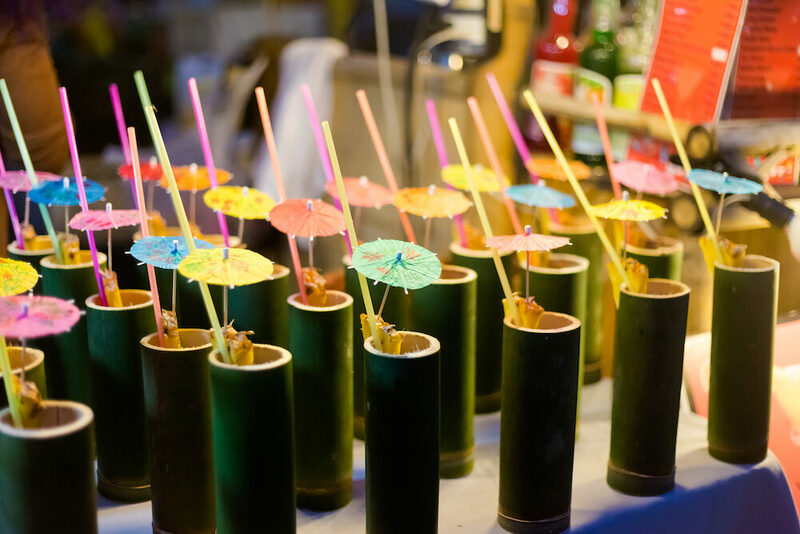 When you’ve wandered long enough, enjoy a drink and watch a Thai musical performance at the central stage. Less than an hour away from Krabi Town is the district of Klong Thom. 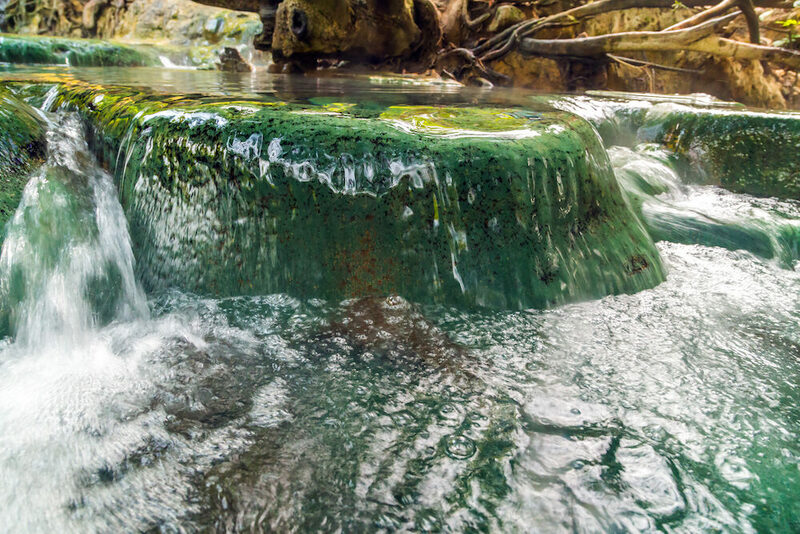 There are a few hot springs in the area that are as beautiful as they are therapeutic. 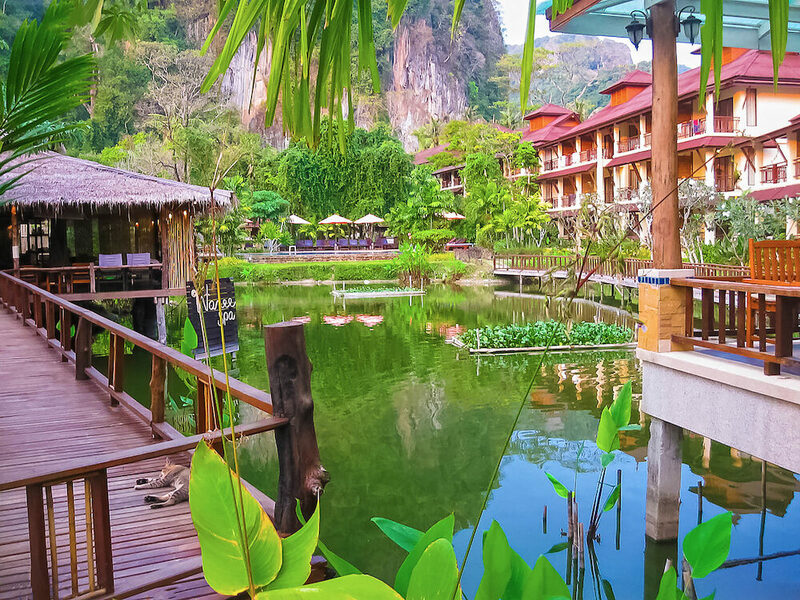 Krabi Hot Springs is a serene spot under the shade of the tropical rainforest. It gets quite busy in the afternoons, so try to get there as early as possible. Many locals also enjoy going to Saline Hot Spring, the smaller of the two main areas. 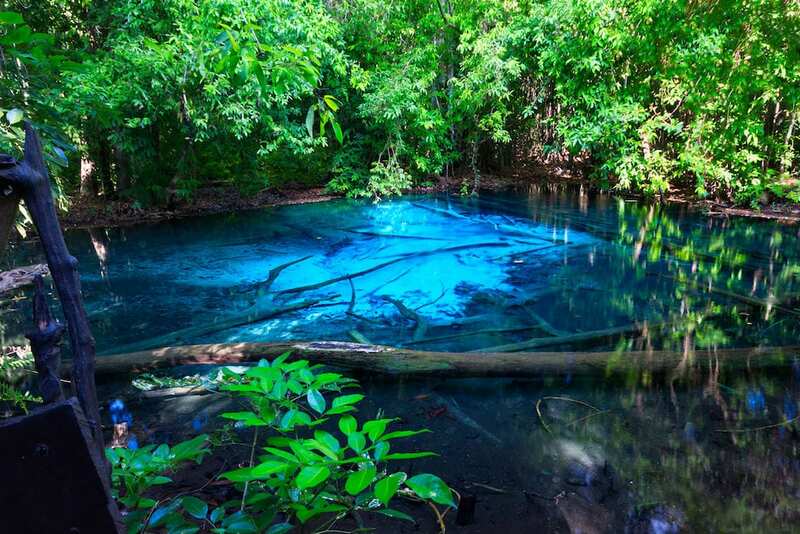 Close by the Krabi Hot Springs in the Thung Teao Forest Natural Park is the magnificent Emerald Pool. Photos simply cannot do the crystal-clear water justice. You’ll need to walk over a kilometre to reach the stunning mineral pool, but it’s absolutely worth the trek. Again, come as early as you can to beat the crowds and have the most peaceful experience. This Buddhist temple is only 10 kilometres northeast of Krabi Town. 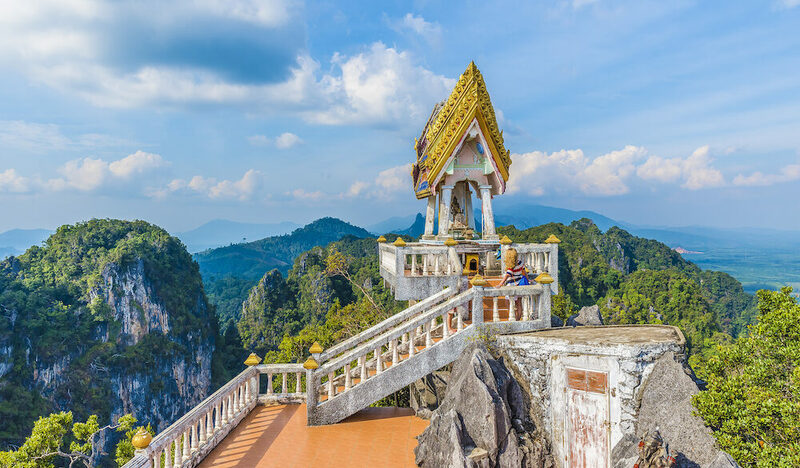 The strenuous 1,237 steps to reach the summit may turn some people away, but the view of nearby Krabi is beautifully rewarding. 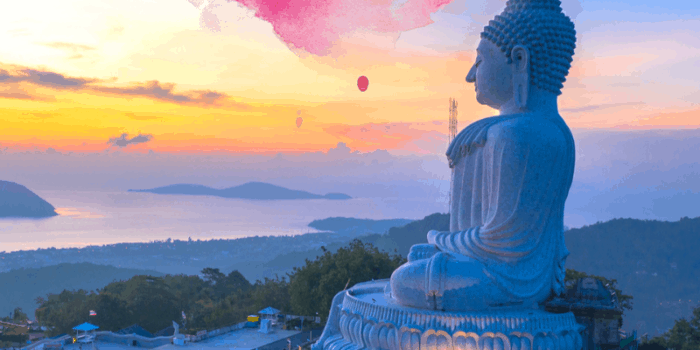 A large, golden Buddha statue will greet you once you make it to the top. Wat Tham Suea, as it’s known in Thai, was named for the tiger paw prints once found in the cave. Railay is one of Krabi’s most iconic beach areas and only accessible by boat from Ao Nang. Fortunately, the boats depart hourly and take only 15 minutes. The limestone cliffs attract rock climbers, and the serene beaches draw in anyone looking for a relaxing, sunny atmosphere. With a jungle right by the sand, be on the lookout for many playful yet sneaky monkeys. Further down from Railay Beach is the gorgeous Phra Nang. More limestone cliffs and caves create a picturesque backdrop during your swim. It’s a wonderful place to rent a kayak and go snorkelling. If you’d like to go scuba diving, there are nearby centres where you can book an instructor. 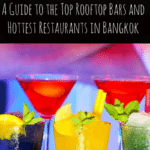 Thailand is a haven for foodies, and Krabi is no exception. You’ll have no trouble finding great restaurants and vendors that serve fresh fruit, spicy curries and grilled meats. Many of the street food dishes cost only 30 to 60 baht, so with such affordable prices, why not eat as much as you want? Pad Thai: Of course, this classic Thai dish had to be mentioned! There’s no need to overpay at fancy restaurants, as the most delicious pad Thai can be found at street vendors. There are varieties for everyone, including shrimp, chicken and vegetarian. Som tam: After eating your weight in fried noodles, a light, fresh meal may be just what you need. 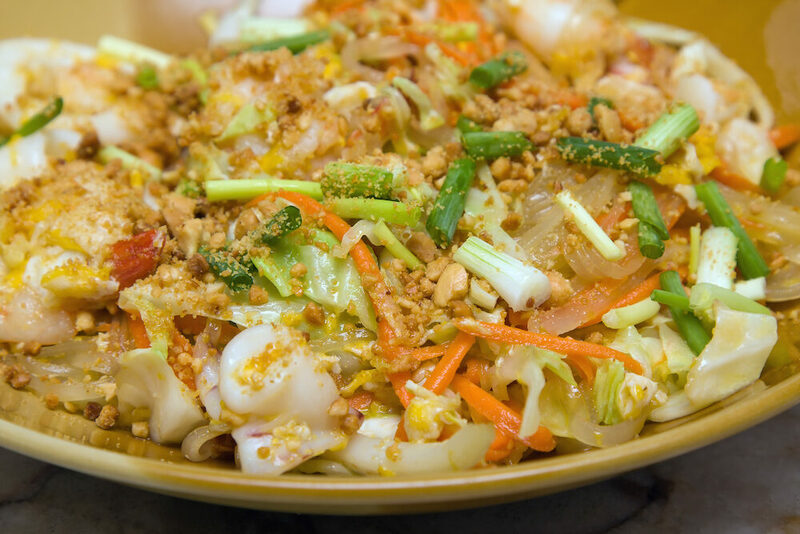 This savoury green papaya salad is a local favourite and is available everywhere. Although it’s served cold, it has a spicy kick to it. Mango sticky rice: One of Thailand’s most popular traditional desserts is just what the name suggests. 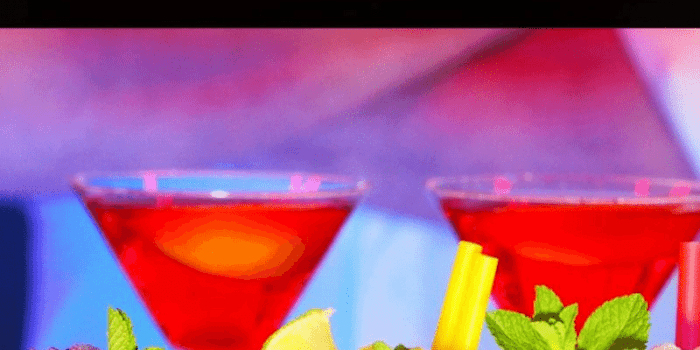 It’s a deliciously sweet yet healthy post-dinner treat that you’ll never get sick of. 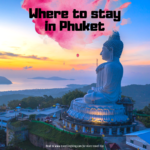 While you may want to stay on many of Krabi’s gorgeous islands too, we’ve picked out some of the best hotels and hostels on the mainland for you. 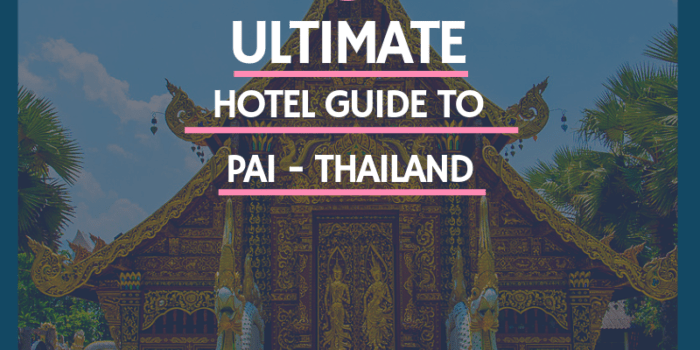 Here are a few recommendations to help you narrow down where to stay in Krabi. Bliss Resort is a welcoming accommodation that’s right along the tranquil Klong Muang Beach. You’ll have access to the hotel’s private beach area, mere steps from your door. The rooms are industrial and modern but incorporate warm and cosy decor. If you want to stay somewhere peaceful but not too far from Krabi Town, this resort will be perfect for you. Whether you’re travelling solo or with friends, Pak-Up Hostel is the best budget-friendly accommodation in Krabi Town. It’s on the corner of the busy Thanon Utarakit road, a prime location to begin exploring and meeting fellow travellers. Their bar area has great music, a pool table, and a free barbecue every night. Although there’s such a lively social scene, all dorms and double rooms at Pak-Up are incredibly clean. If a garden oasis retreat is more your style, you’ll fall in love with Phanom Bencha Mountain Resort. This resort is a special and harmonious place, located 20 kilometres north of Krabi Town at the foothills of a national park. 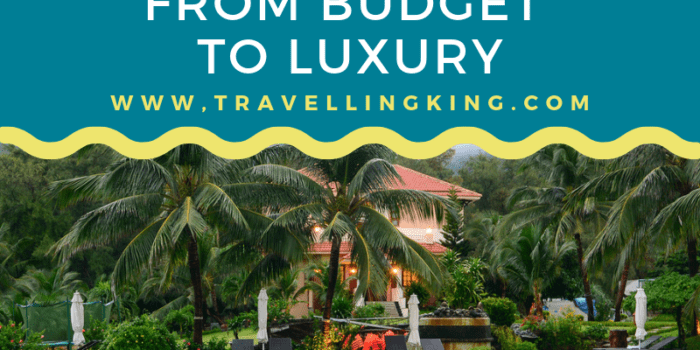 The standard and two-bedroom bungalows are surrounded by fruit trees and tropical fauna. A stay here gives you the opportunity to go on a nighttime rainforest trek to see the different forms of wildlife. With so many island hopping tours available, how is anyone to choose between them all? 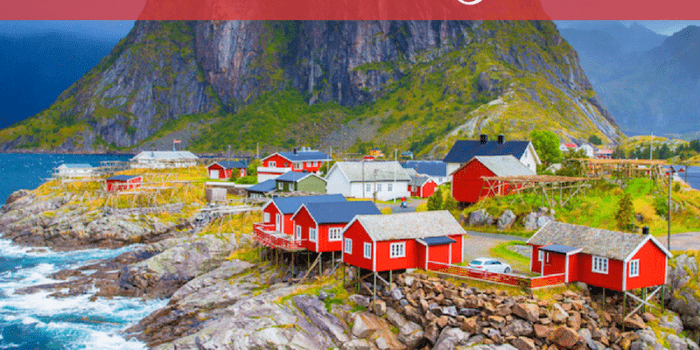 Here’s a rundown of some of the best-rated island tours to help you pick the one that’s right for you. A six-hour sunset cruise allows you to explore five islands along the coast of Krabi. You’ll have snorkelling gear and stand-up paddle boards provided, with plenty of opportunities to have a relaxing swim. The cruise also has a cocktail bar on board and offers a Thai buffet for dinner (including vegetarian options). 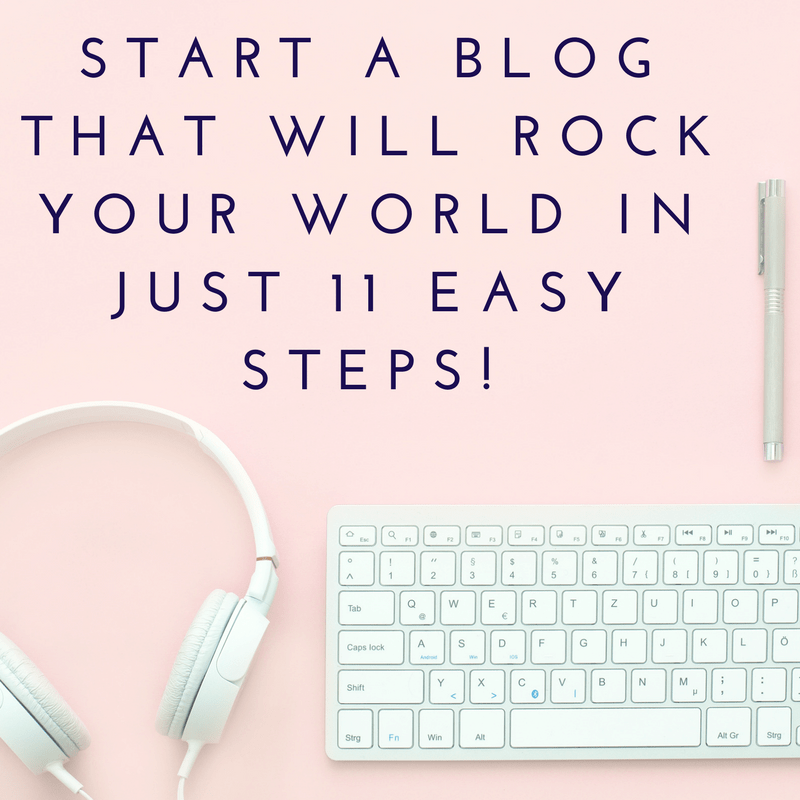 With all of this included and more, you’re guaranteed an enjoyable day. 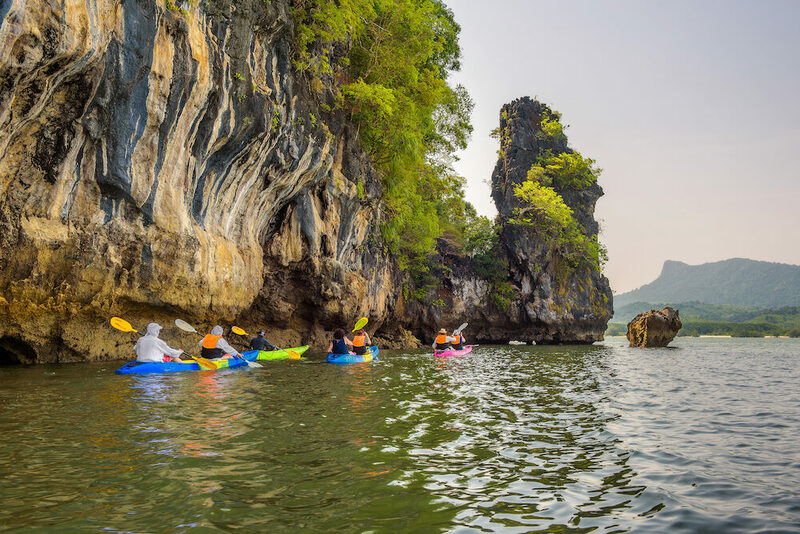 For those seeking adventurous things to do in Krabi, Hong by Starlight runs a sea cave kayaking tour. Paddle through the limestone caves and emerald lagoons of Phang Nga Bay with an experienced guide. The tour lasts 10 hours, so you can experience the area during the daytime, sunset, and under the moonlight. If you want to explore the land instead, why not try a beginner’s rock climbing tour on Railay Beach? 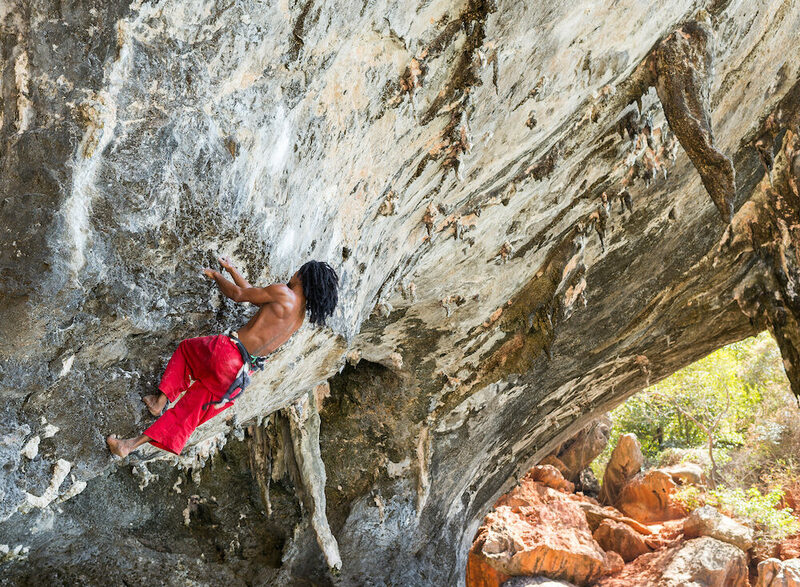 Challenge yourself on Krabi’s famous limestone rocks and be rewarded with once-in-a-lifetime scenic views. Suitable for all ages and skill levels, this four-hour experience is one you won’t soon forget. While the Phi Phi Islands are technically part of Krabi Province, a 90-minute ferry ride is required to get there. Therefore, you should dedicate an entire day to exploring this beautiful island group. If you’re not sure which spots to visit, you might like to opt for an early-bird speedboat tour run by Sea Eagle. Leave at sunrise, be taken to several of Phi Phi’s most impressive islands, and enjoy lunch at a cliff-side restaurant. This excursion lasts all day and you’ll be dropped back off in Krabi by the late afternoon. 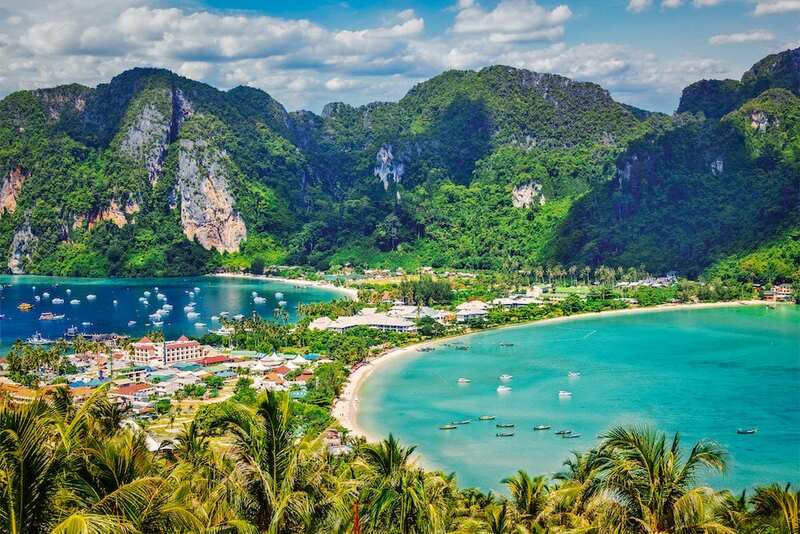 Krabi, Thailand really is one of the most beautiful destinations on the planet. If you’re lucky enough to travel here, please be a responsible tourist and help to keep the place as clean as possible!